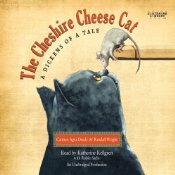 The Cheshire Cheese Cat: A Dickens of a Tale by Carmen Agra Deedy and Randall Wright, read by Katherine Kellgren and Robin Sachs. Grades 3-7. Listening Library, 2012 (Peachtree Publishers, 2011). 4 discs. Review copy provided by my local library. Skilley, a London alley cat, longs for the warm hearth of The Cheshire Cheese Inn, so when he hears that they're looking for a mouser, he shows up. But Skilley has a terrible secret: he eats cheese instead of mice! When the smartest mouse at the inn figures out Skilley's secret, they arrange a deal to benefit them both: the mice will provide Skilley with cheese and he won't hunt them as long as they try to stay out of sight. But things get more complicated when Skilley learns that there's a captive at the inn... and he needs help. This is a solid, charming story with plenty of fun Dickensian references, very timely for the hundredth anniversary of Charles Dickens's birth. Kids won't necessarily get the Dickens references, but they're fun nonetheless and this just may be the kind of book that kids will revisit at an older age. The characters and the interesting relationship between an educated mouse and a street cat working together drew me into the story and there's no one better to bring characters to life than narrator Katherine Kellgren. Kellgren rocks it once again with this fully voiced production. I love her range of voices, from the prim and proper (and tiny!) mouse Pip to the rough-and-tumble alley cats to all the humans of the Cheshire Cheese. She has a gift for getting characters' personalities across in the way she voices them, and that truly brings the story to life. Robin Sachs narrates bits here and there from the writings of Charles Dickens as he observes the small dramas happening in the Cheshire Cheese and tries to come up with an opening line for his next novel. Sachs reads with dignity befitting such an esteemed historical figure, and his bits add an authenticity to the story. I'd recommend this story to fans of classic animal stories like Charlotte's Web, A Cricket in Times Square, or Bunnicula. The audiobook would make a fantastic family listen, as I think it will appeal to a wide range of ages and adults who will pick up on the Dickens references. The Cheshire Cheese Cat was the 2011 Cybils Winner in the Middle Grade Science Fiction & Fantasy Category and a contestant in SLJ's Battle of the Books. Also check out Betsy's review at A Fuse #8 Production. The Cheshire Cheese Cat is available now! * Hey, I'm an Audible affiliate, which means that if you purchase audiobooks after clicking on the links here I may get a small commission.